Harley was born in 1828 at Seacombe, near Liverpool, the son of Robert Harley a Scottish merchant and Wesleyan minister. Though he detested arithmetic as a child, his mathematical aptitude developed rapidly while he was at William Hoole’s school at Blackburn. At the age of sixteen he became a mathematics master at Seacombe, and in 1845 he returned as head assistant master to his old school at Blackburn. In 1851 Harley became a divinity student at Airedale Independent College, Bradford, and on completing his course entered the Congregational ministry at Brighouse, Yorkshire. Concurrently he served from 1864-1868 as professor of mathematics and logic at Airedale College, having already established a national reputation in these fields. , notably Boolean logic and complex algebra. 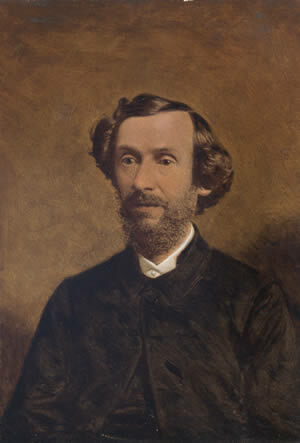 In recognition of his advances with quintic and sextic equations in particular, Harley was elected a Fellow of the Royal Society in 1863, and two years later he took a leading role in establishing the Mathematical Society. In 1868 he left Brighouse to serve as Pastor of the Bond Street Congregational Church, Leicester (1868–72), moving on to Mill Hill, near London, as vice-master of Mill Hill School and later as Principal of Huddersfield College, Yorkshire. From 1886 to 1890 he was Minister of the Congregational Church at Oxford, and was made an honorary MA by the University. After a short period as Minister of the Congregational Church in Sydney, Australia, followed by service as Pastor at Halifax, he retired to Forest Hill, London, where he died and was buried in Ladywell Cemetery in 1910. Though his stay in Leicester was quite short, he made a substantial impact on the Town during his five years. In addition to his service as President of the Lit. & Phil. Harley also was appointed a member of the first School Board, of the Corporation’s Free Library Committee, and an Honorary Curator of the Museum. During his year as President the Council of the Society decided to include in the programme for the first time lectures by non-members, and to pay fees to distinguished lecturers for these. This was very controversial and strong opposed by some members, led by the Society’s founder, Dr George Shaw. However, what remains today the Society’s normal practice began in October 1870 with the first ‘professional’ lecture. This was by Thomas Henry Huxley on ‘What is to be learned from a piece of coal’. A controversy rocked the Society during Harley’s presidential year. The Conservatives, resurgent in Leicester life at last after their near annihilation in the 1835 municipal reforms, complained that the guarantee in the Society’s original constitution that it would maintain a careful balance between the town’s two political factions was not being honoured: rather than equal numbers four of the five Vice-Presidents and 19 of the 24 other members on the Society’s Council were Liberals.